54 Merrion Road , D4 Dublin, Irland. Merrion Hall is a luxury Edwardian style boutique hotel in the heart of exclusive Ballsbridge, Dublin 4. There is a choice of classic and deluxe rooms as well as a number of stunning suites. 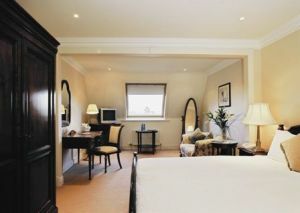 The rooms are air conditioned, spacious and elegant, some with four poster beds, spa baths and broadband access. This charming property has achieved many awards and accolades and is consistently included in Bridgestone's Top 100 Properties in Ireland. The award winning breakfast is served in the conservatory dining room which overlooks the courtyard and garden. The perfect blend of location, service and luxury. nähe dem Messegelände, Bahnhofsnähe, Park, Stadtzentrum, Flughafennähe, in der Nähe der U-Bahn / Strassenbahn, in der Nähe der Einkaufszentrum. Mehr als 3 Tage vor Anreise : keine Annulierungkosten. Weniger als 1 Tag(e) vor Anreise : 2 Nächte zu zahlen. Wenn man die Reservierung nicht benutzt und keine Annulierung macht: Die ersten 2 Nächte sollen gezahlt worden. Kinder weniger als 3 Jahr(e) alt: gratis. ältere Kinder und Erwachsene: 40.00 € pro zusätzliches Bett. Our kitchen prides itself on a fine blend of local and international dishes served in the conservatory dining room overlooking the charming courtyard and gardens. The award winning Full Irish Breakfast is not to be missed. Afternoon teas and fine wines are served in the main drawing rooms and library where guests can relax and choose from a fine selection of Irish and international literature. Merrion Hall enjoys a prime location opposite the Royal Dublin Society exhibition centre (RDS) in the exclusive embassy district in Dublin 4. The DART and Dublin bus services to the city centre are within easy walking distance. Charming Sandymount village with its array of bars and restaurants is a short stroll from the hotel as is the beach and strand. Dublin city centre is a mere 8 minutes away by DART (Dublin's Electric Train). The city's most beloved tourist attractions are found here such as Trinity College, the Book of Kells, Dublin Castle, National Art Gallery, Grafton Street, O'Connell Bridge, the Spire and the National Museum of Ireland. Merrion Hall is located 20 minutes from Dublin Airport by car. 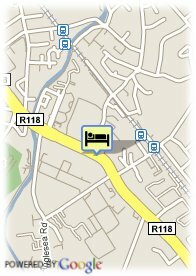 There is also a luxury coach link available to transport guests to Merrion Road. Just 6 minutes to the O2 arena by car.